When the original ten-piece Miami Sound Machine is banging out a full-on Latin beat smack dab onstage and bringing sizzling hot salsa rhythms and house party funk, you can party like it’s 1985, the year the group’s huge crossover hit “Conga” soared to the top of the Billboard pop charts. 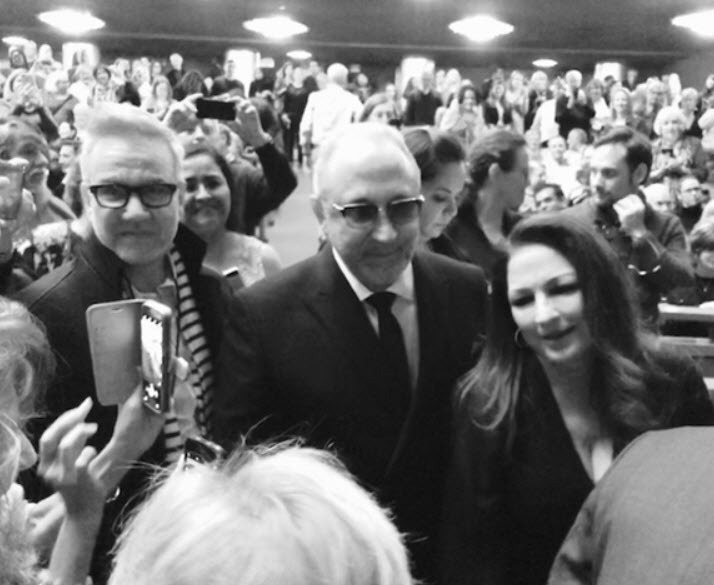 It didn’t mitigate the excitement that the show’s producers Gloria and Emilio Estefan were in the house last night driving the on-their-feet audience wild with cheers and selfies. But when it comes right down to it, it’s her story. Their story. A universal story of hopeful immigrants everywhere, that bonds us to their triumphs and tragedies in this electrifying musical. On Your Feet! 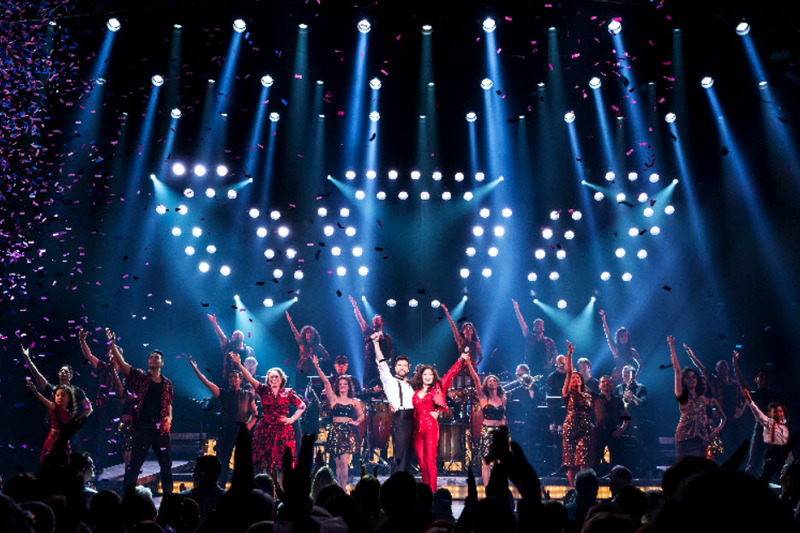 tells the story of 26-time Grammy Award-winning pop singer/songwriter Gloria Estefan and her producer/husband Emilio and their sensational rise to fame. In spite of a talent agent who blocked the act from crossing over into mainstream American pop and a record company who wouldn’t allow them to sing in English, the pair did an end-run around discrimination by directly approaching local DJ’s and dance clubs where their beat-driven music had an immediate fan base. “See this face?” Emilio demands of his agent. “This is an American!” With this line, the audience broke into instantaneous and sympathetic applause. After all, it’s kill DACA season and we feel their pain. 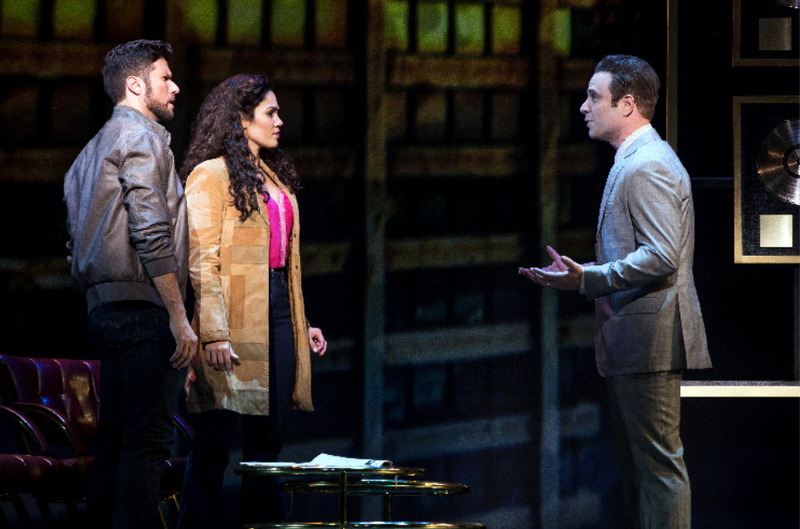 The “jukebox musical”, as these throwback rock musicals are familiarly called (though one wonders if anyone from that era has ever played a jukebox), depicts the Estefans as children leaving on the “Pedro Pan” flights from Cuba in the early 60’s – flights that brought families from Havana to Miami from the fresh hell that was Batista’s revolution – and settling into the burgeoning Cuban community in Miami. Emilio hears Gloria sing and invites her to join his band, the Miami Latin Boys to gig weddings, bar mitzvahs and quinceañeras. To her mother’s dismay, Gloria joins the band. Even a mother’s wishes can’t hold back her teenager’s dreams or her talent. Flashbacks include Havana’s Montmartre Club and her mother’s truncated career as a nightclub singer, her Vietnam vet father José’s (Jason Martinez) tragic end, and little Gloria’s fondness for her grandmother (Alma Cuervo) and her guitar. The story charts the pop star’s meteoric success and the near career-ending tragedy of the car accident that left her unable to perform for months. It’s a deeply personal story that parallels artists’ dreams and immigrants’ aspirations. 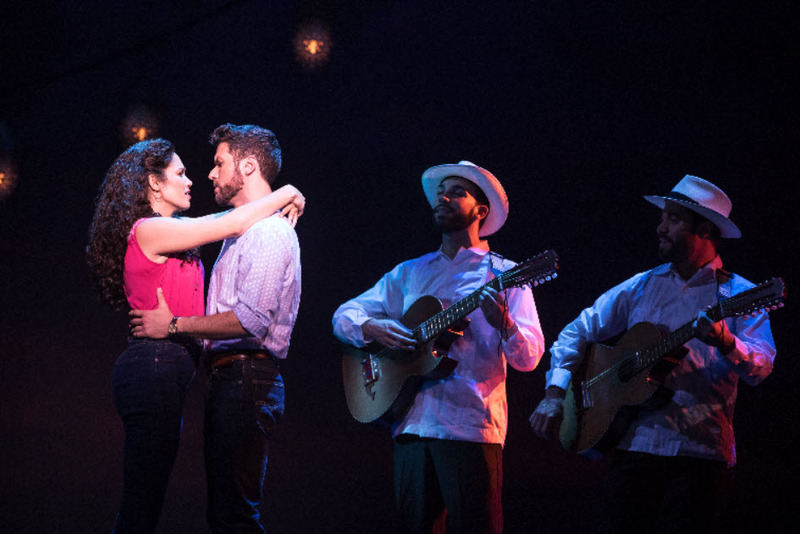 Colored by the aqua and hot pink colors made popular by Miami Vice, it stars Christie Prades and Mauricio Martinez (from the original Broadway cast) as Gloria and Emilio. 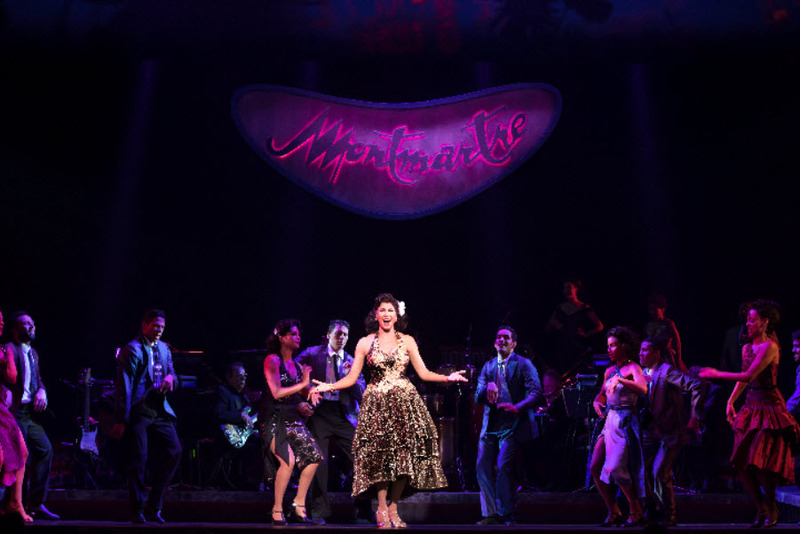 The Tony Award-winning musical includes many of Gloria’s greatest hits in 26 numbers from “Live for Loving You”, “Get on Your Feet” and “Rhythm Is Gonna Get You”, to heart-melting ballads like “Don’t Wanna Lose You” and “Here We Are”. 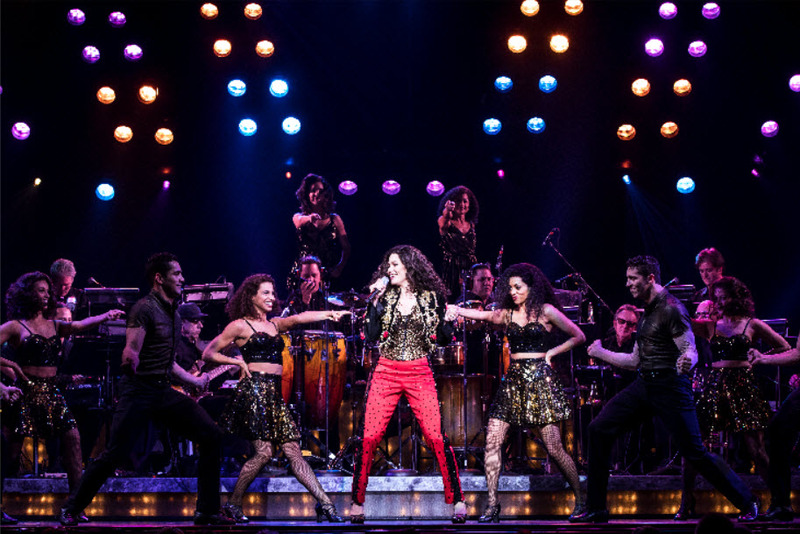 80’s period costumes by Emilio Sosa and Cuba-evoking sets by David Rockwell, the band is joined by three additional musicians from the Kennedy Center Opera House Orchestra. Filled with uplifting sparkle. Get ready to party Latin-style! Highly recommended for the whole family. Through January 21st in the Opera House at The Kennedy Center, 2700 F St., NW, Washington, DC. For tickets and information call 202 467-4600 or visit www.Kennedy-Center.org.